Boaters ask a lot from their lights. Sometimes you need a bright white light for reading or rigging fishing gear. Other times you need a medium amount of light for dining or entertaining. Still, other times you want different colors of light to increases your boats “cool” factor. On top of all that, you need low levels of red light that won’t hurt your night vision when underway after dark. Do you need three different lights? No, You need the Shadow-Caster SCM-DL LED Down Light. Shadow-Caster SCM-DL LED Down Lights are the easy way to replace existing lights or add new lighting to your boat. They work equally well in the cabin, in the cockpit, or under a T-top. 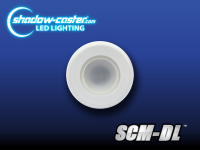 The SCM-DL is dimmable and comes in several color options. At only 2″ across and less than 1/4″ thick, the SCM-CL can be mounted almost anywhere on your boat. Put light where you need it, not where it will fit. The SCM-CL comes in four different color options. White– Best for interior cabins, heads, galley or wherever you need bright white light. White is non-dimmable. White/Blue– Perfect for lighting cabins, dining areas, and transoms. Choose white when you need to see clearly. Switch to blue for a more mellow tone. White/Blue is dimmable. White/Blue/Red– This is the light you want illuminating your helm. White for when you need to see clearly. Blue looks amazing, red for improved night vision. White/Blue/Red is dimmable. Color Changing– When you want it all. Color Changing Downlights can be synced with your color changing underwater lights and deck lights. Change colors, brightness, fade, strobe, or make your lights dance to the music with the SCM-ZC Zone Controller or Garmin® OneHelm™. White Powder Coat Finish- Harder and tougher than paint. It won’t scratch, chip, or fade. Glass Lens- Stands up to the elements and will never yellow. Size- At only 2″ across and less than 1/4″ thick, the SCM-DL will fit almost anywhere. Mounting hardware is included.